So… we did it again. As you may recall, we did a survey about Americans’ email habits back in September, and found that 70% of people surveyed admitted to emailing after work hours – and 50% emailed while on vacation. It was the last bit that inspired us to do the next survey. Surely people aren’t emailing from the Thanksgiving table, eh? Have we really taken it this far? Alas, the answer is yes – for some of us. And not only are we checking email – 19% of us said we are “relieved” or “thankful” for the distraction of email on holidays! Oh my, people. What have we become? Aunt Betty would not be pleased. That said, 41 percent of respondents said they either annoyed, frustrated or resentful after receiving these emails. In all honesty, living in Silicon Valley where it seems people reach for their smartphone every time our life has a pause, we aren’t all that surprised that this many people may be sneaking a peak at their email while dining with family and friends this Thursday (us? why never! ), but we were surprised at how consistent this was across the US. 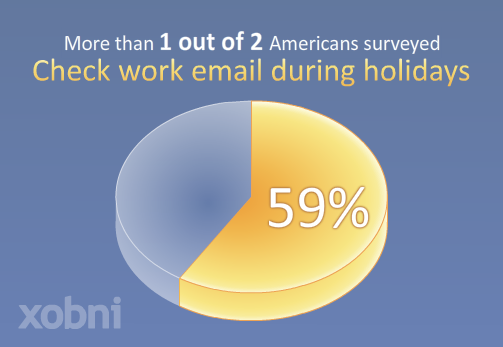 Of the people that admitted to checking work email on the holiday, 28% said they will do so multiple times throughout the day and over half (55%) check work email at least once. Employed middle-aged adults feel the greatest urge, with 65 percent of those aged 35-44 stating that they have checked work emails on holidays. 41 percent of those that received work emails from a co-worker/client while they had time off for the holidays said they were either annoyed, frustrated or resentful after receiving these emails – and younger people (ages 18-34) had the strongest negative opinion among the age groups. The survey also found that 12 percent of respondents actually “dread” seeing work emails populate their inbox and 10 percent even feel pity for those who do send work-related emails on holidays. Working Men are guiltier than working women when it comes to checking email on holidays – 67 percent and 50 percent, respectfully, admitted to checking email on holidays. And while the East and West coasts are traditionally considered to be the beating hearts of capitalism in the US, the survey found that the Southern region led the way with the most people sharing that they check work emails during the Holidays –63 percent (compared to 57 percent for the West and 59for the Northeast). One in ten people who admitted to checking email while off for a holiday stated that they did so while spending time with friends or relatives at Holiday parties/gatherings or during meals. Full press release with results can be found here.